Known today as one of the most recognized brand names for luxury clothing, Vakko was founded in 1934 as a small hat shop called Sen Sapka (Merry Hats). The name changed to Vakko shortly thereafter and the company started producing scarves using Turkish silk, cotton and wool. 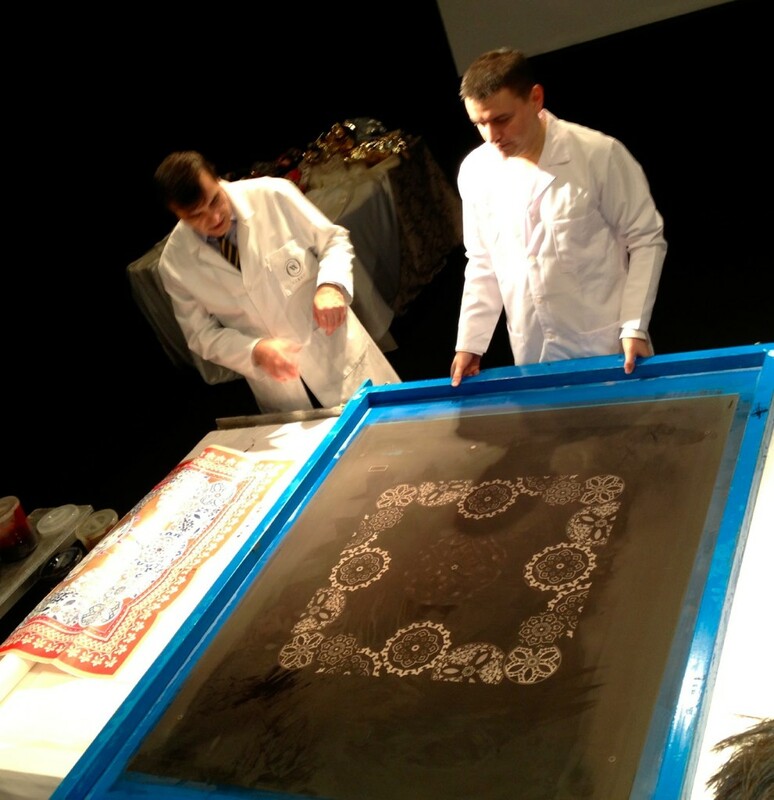 A small silk screening workshop was founded in the Kurtulus district of Istanbul, which Vakko still uses today. 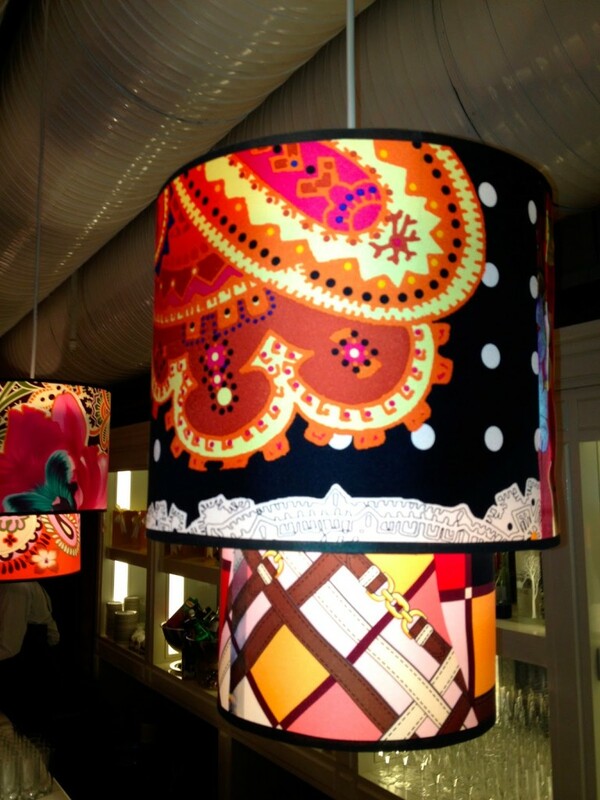 In addition to its success in the scarf industry, Vakko is an undisputed leader in fashion with its ready-to-wear line, its Shoes&Bags stores and the Vakko Wedding House. On our first evening in Istanbul, we went to Vakko’s five-floor flagship department store in the Nisantasi district for an introduction to Turkish fashion. The following day, after a boat tour along the Bosphorus, we were treated to lunch and a tour of the Vakko Fashion Center in Nakkastepe, on the Asian side of Istanbul. The New York architecture firm of REX took an unfinished hotel project and transformed it into two office buildings, where one is built inside the other. The buildings house an Art Center, showrooms, the Vitali Hakko Art Library, an auditorium, art gallery and museum, as well as management and staff offices. 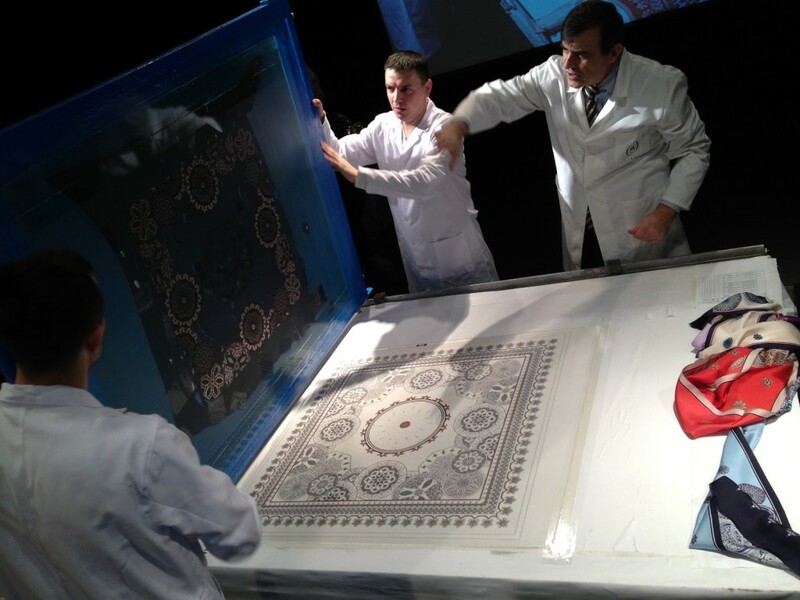 In the auditorium, we were given a silk-screen printing demonstration. 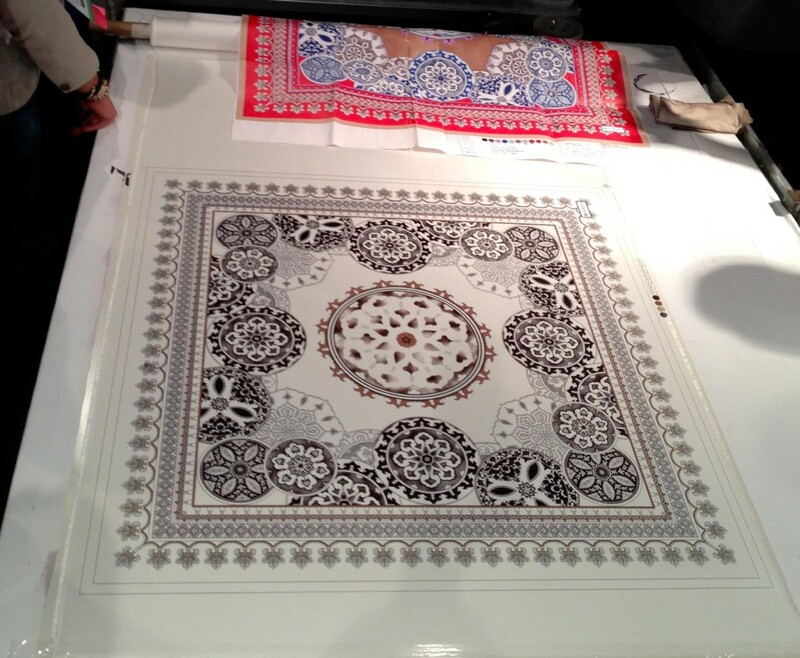 To explain the process in its simplest terms, silk-screen printing involves a different screen for each color of the scarf motif. Imagine it as layers of cut paper, each color requiring its own screen. 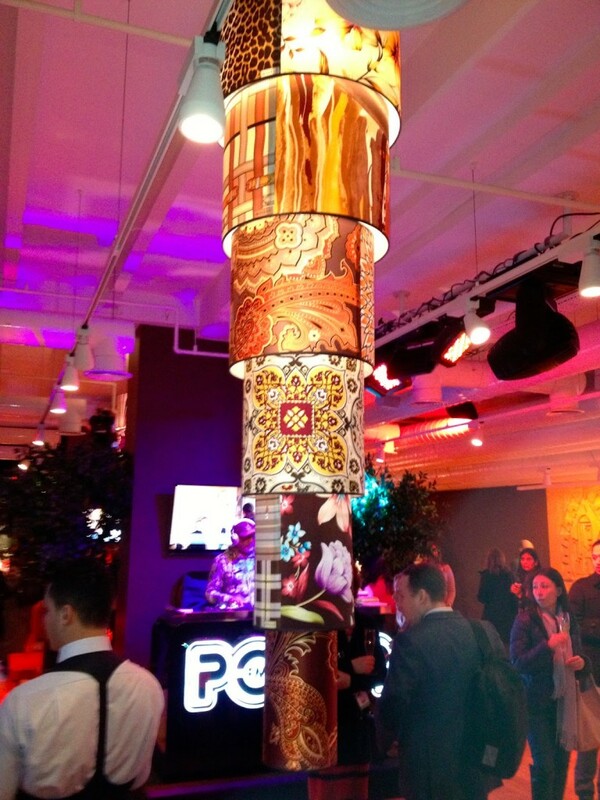 For this particular scarf, there were 11 screens, or 11 “layers”. You could say that Vakko is the Hermes of Turkey. Incidentally, on the flight home, I noticed the stewardesses on Turkish Airlines wear Vakko scarves. It’s a great airline with a convenient direct flight from LA to Istanbul. 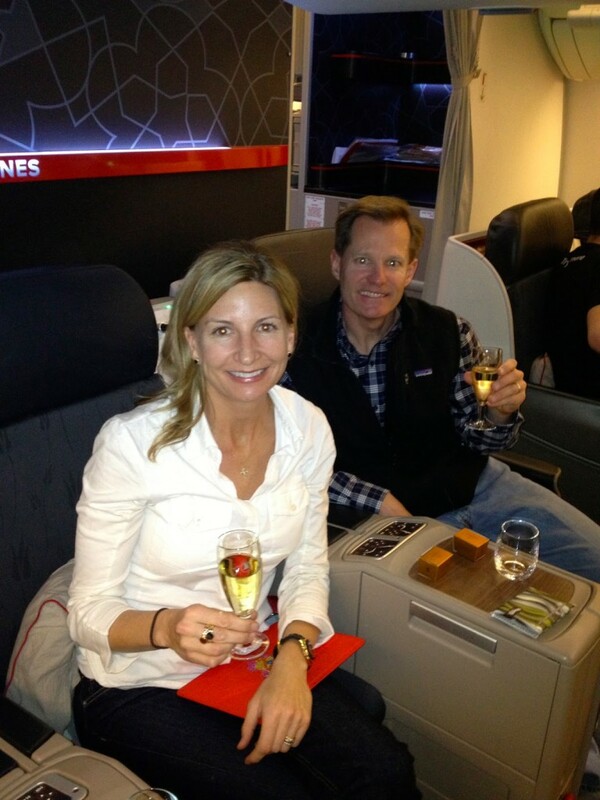 I will leave you with a pic of me and Hubby enjoying some bubbly on our flight.